From the New York Times bestselling author of The Wonderful Things You Will Be comes the companion to Dream Animals -- a celebration of the imagination of children who dream both day and night! 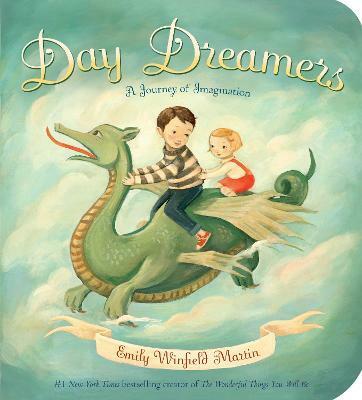 Emily Winfield Martin shows little ones that letting their imaginations run free will lead them into fantastical day dreams. Whether cloud-gazing or wandering through a museum, reading a book or playing in a tide pool, the children in this board book encounter magical creatures such as dragons, unicorns, griffins, and jackalopes. Whimsical rhyming text accompanies the dream-worthy illustrations. EMILY WINFIELD MARTIN sketches, paints, and stitches to create imaginary worlds and characters. She is the author-illustrator of many picture books, including Dream Animals, Day Dreamers, and The Wonderful Things You Will Be, as well as a chapter book, Oddfellow's Orphanage. Emily lives among the giant fir trees of Portland, Oregon, with her fellow adventurer, Josiah, and their cat, Miette. Visit her online at EmilyWinfieldMartin.com, BlackApple.typepad.com, or Etsy.com/shop/theblackapple.